Former WBA jr welter champ Souleyman M’Baye is set to make a low key return March 21 on his 38th birthday in Budapest, Hungary. M’Baye, 39-4-1, has been inactive since losing the WBA interim title to Ismael El Massoudi in July of 2011 on a 12th-round injury related tko. M'Baye turned pro in 1998 and have through the years been fighting all over Europe. 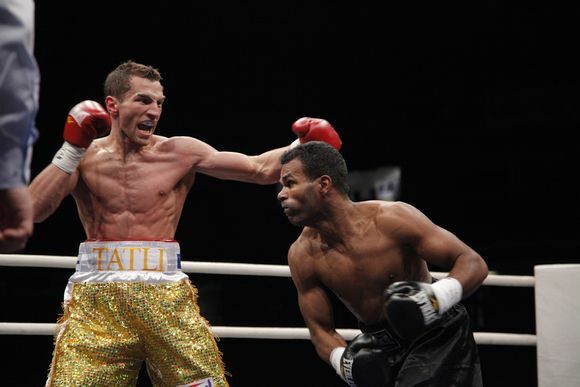 He first won the EBU title in 2002 but lost to Vivian Harris in 2003 in his first attempt to win a world title and it wasn´t until 2006 Souleyman became WBA jr welter king by beating Raul Balbi. He lost the title to Gavin Rees but bounced back to regain the EBU belt and became WBA interim champ in 2010. Opponent for now on the Budapest bill is Laszlo Haaz and it´s the kind of matchup where only one man can win and it´s not Haaz. The show is promoted by Profi-Box Promotion headed by Zoltan Petranyi and Zoltan headlines the bill by defending the Hungarian heavyweight title against. Attila Palko. WBFed heavyweight champ Michael Grant, 48-4, will defend the title May 24 in Noisy le Grand, France, against Carlos Takam, from Cameroons but based in France. Grant was at time regarded as maybe the next real thing but when he beat Frans Both in South Africa late 2011 with a come from behind knockout in the final round it was in a fight he wasn´t supposed to win and he´s been inactive since then. In Takam, 27-1, Grant face a strong but relatively untested challenger who´s best wins are over Frans Botha and Gbenga Oloukun while the sole loss came against Gregory Tony. World Boxing Federation is not to be confused with World Boxing Foundation or World Boxing Forum. Varchol was down in the second. Jamoye retained the EBU bantam title with Sexton floored twice in the eighth and it was stopped. Sexton was also down in the seventh and had a point deducted in the sixth for holding..
vacant WBC Youth Silver, lightwelter title, scored 97-93 twice and 99-92. Tatli won the WBA I/C with a unanimous decision over the dangerous Lora, who was floored in the last. It was scored 116-112, 117-110 and 119-111. Jomardashvili comes in well over the contracted weight and retires after being floored in the fifth. 40-34 twice and 40-33. Toth was floored in the fourth and also had a point deducted for holding. March 9, Hamburg, GER, CU Halle, est 300, ITS Promotion, bdb. Salzmann won the WBC Baltic Silver title on scores of 97-93, 96-94 and 97-91 (three rounds scored 10-8) after a foulfilled brawl where Salzmann knew just too much for Mammadov, who just kept coming. Mammadov was hurt late in the second and Salzmann was cut on the scalp earlier in the round. Reimer won the vacant GBU I/C title with a come from behind stoppage win over Kovasevic, who was good but too green and as he tired Reimer, an awkward southpaw who kept changing stance got him with a big right hook. Predrag got up was retired by cornerman Aleksander Petkovic (who had fought earlier on the billo. Fecko, a southpaw, can box a bit but wasn´t overly interested and indicated he had an injured left arm and when Bejaran went to the body with a right it seemed as if he hit the arm and Fecko went down in pain, got up but was counted out and didn´t complain. Petkovic toyed with his overmatched opponent and then went to the body and Hadzic bent over and was rescued. Hadzic replaced Gaza Nemeth. 40-35 on all cards. Jasukievic was down in the second but Dugazaev while strong was too green. Dugazaev had Konstantin Airich as chief cornerman. Korda looked the part but proved to be painfully slow once Feigenbutz opened up and scored two knockdowns. pi won the vacant EU flyweight title. Pozo - in his final fight - came in as late notice for Giuseppe Lagana and was floored in the first and stopped. Encarnacion retained the Spanish jr lightweight title on scores of 99-92, 98-93 and 98-93. Crespo retained the Spanish title on scores of 97-96, 96-95 and 96-94. Marsili won the vacant EBU lightweight title with a second round stoppage of Giacon, who was floored twice in the first and again in the second before it was called off. vacant WBFed I/C title, scored 120-108, 119-109 and 118-110. Italian supermiddle title, scored 98-91, 97-93 twice. vacant IBF I/C lightweight tiltle, scored 69-64 after it was stopped with Klimov accidentally cut. PABA lightweight title, Padilla floored twice.